Joshspot Tv had an interview with an upcoming artist called "KVNG MARSHAL"
In short,we had an interview with him and asked him many questions.We asked him what type of Music he is into. I'm just into any cool music. I'm neither singing for fun or attention but the main purpose of my song is to motivate and educate people. He made us realise he is not into Song but Music . This triggers the question"WHAT IS THE DIFFERENCE BETWEEN MUSIC AND SONG"
Like I said earlier I'm not singing for fun or attention but I'm singing to pass out a message .Every music must pass out at least a mesaage,lesson or information.Any music that is not passing out at least a message is a song. I'm coming to the Music industry to make a difference ,to pass out message ,to make a change,not just singing a song. Most African parents don't want any of their children in the music industry because of their common believe that such child is a wayward person,such child can't secure a job,such child is a yahoo boy or he/she is not responsible.I want to change this believe in parents. He said one of his Role model is the popular artist known as "ASA" . Then we asked him Remember ASA sings a cool and solemn music but most of your music are majorly "RAP". Can you explain why?? I felt in every music I sing their must be LIFE. Any music without LIFE is dead. I'm bringing in what people qill like,enjoy and what they can learn from. .Be part of this interview.If you wish to ask him a question.Drop it in the comment box below. Youcan catch up with him or invite him for any show anytime. 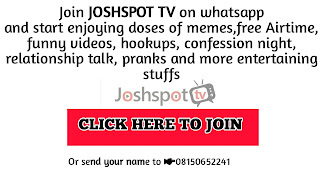 Ps:This is a transcript of JOSHSPOT TV interview with Kvng Marshal.To watch the full video ,subscribe to YouTube channel here.